Add a little flair to your signature Italian-style menu items with the Royal Paper R829 2 1/2 Italian flag food pick. It's perfect for holding together sausage or beef sandwiches that need help staying together. The safe, flagged edge makes it easy for staff to grasp when inserting the pick, or for customers to pull when removing it. At the same time, a sharper, pointed edge ensures quick and clean insertion every time. I love these darn things. We have an Italian Restaurant so on our subs we put these tooth picks which add a cute Italian touch to them. Plus it’s a toothpick the customers can use. So special touch plus toothpick it’s an extra! There super cheap too! These italian flag picks are incredibly well made. Nice detail in the colors, and the paper is starched so that it stands outward at all times. Great product! We used these in a wedding reception for an Italian couple and they were a huge hit. The toothpicks are strong and the flags stay in shape. Bonjourno, Italia! We used these adorable toothpicks to distinguish between the sanwiches that contained genoa salami and used american flags for the ones that contained ham. Perfect! This one hundred and forty-four count box of Royal Paper two and one-half inch Italian Flag Food Picks is great for Italian themed parties and foods. I really like how sturdy they feel. Well-constructed. I really hope to see additional designs and even flavors for the holidays, which would be great. This Italian Flag food pick is great for serving any Italian food. It is so much fun! Price is great and size of packaging is convenient. I love these Italian flag toothpicks. Excellent for my daughter’s Italian American food protect. She served small finger foods with these flags in them. They are durable, decorative and looked great. These are great Italian flag food picks. The cloth is sealed tightly on the picks and the flag sticks straight out. The pick has a point edge on the end. If you run an Italian deli or your restaurant specializes in Italian food these Italian flag toothpicks could be a great addition to your ambience. Royal paper makes very high quality paper products and these Italian flag toothpicks are no exception. When a customer order cupcakes with an Italian theme for a family reunion, I was glad to find these. An Italian food pick that we used as cupcake toppers. These food picks are so much fun to put on all sorts of foods, though they obviously work best with class Italian recipes. Good value. I love using food picks. Whether for dinner or desserts it's a fun way to dress up your food. I have also purchased the American and Mexican ones too. The flags themselves are very well made of starched paper that stands straight out at all times. The pick is well done also with no sharp edges of any kind. I highly recommend these picks! These Italian Flag food picks are sure to impress your guests. They sure did when I had guests over for lunch and I will definitely be coming back for more. The Royal Paper Italian Flag Food Pick definitely exceeded my expectations. The price is very reasonable and the quality is excellent. I would highly recommend this product. I am giving this item a 5 star rating. I purchased to use at home. Perfect for Italian Sandwiches! Even if you don't work at an Italian restaurant, if you do any sort of cooking Italian food, you should get these. They're so much fun to stick on top of your dish. These flags are a great addition to our Italian dishes such as lasagna. The construction is sturdy, not cheaply made. The price is great and they came package neatly. You don't have to worry about them spilling everywhere. These flag picks are so cute. Always gets people to notice and compliment them. The price is great. Fun to use when having a themed party. Sir Clean recommend this product Italian Flag food pick for the quality and price, you can use to many purpose. The material is good. We like it! Super handy for when I make Italian food. Really gives that diverse feel to my food. Insanely cheap and outstandingly plentiful when it comes to quantity. We've ordered many packs of these food picks of different nationalities! They come in handy for different themed parties and when we have different friends over! Consistent and well made, No problems with flags in box. Looks really great for a festive touch. Colors were clear and well printed with no issues. These are a cool addition to small dishes that are italian and customers seem to love them. I wish they offered more countries. Cheap shipping. LOVED THESE!!! I purchased these for our annual spaghetti dinner to use as a finishing touch for the desserts (put in brownies). LOTS and LOTS of great comments from people about how cute and well made they were. They looked great! Will purchase again for next years event. I like to put these toothpicks into our italian cookie platters. They have an italian flag on them so people know that the cookies are italian flavored. Lovely little flags of Italy. We have customers who ask for them on their cheesecakes or other pastries. Cheap enough to garnish many things. Thumbs up! The 2 1/2" Italian Flag Food Pick works great with meatballs. You can either put them in the meatballs, or place some of the flags in the tray for a decoration. Great for parties. These will come in handy for my Italian themed dinner. They are perfect for an antipasto dish or for an olive and cheese tray. Awesome price for the amount you get. I am very satisfied with these Italian flag food picks. They are perfect for a themed occasion, to go in cupcakes, cheese squares, and other items. They are also well packaged and easy to store. I put these in my kid's lunchbox to hold the sandwiches together. They do the job, are fun to look at, and are cheap to buy. When we began serving pressed Italian sandwiches we used these little flags to hold our sandwiches together. They add a nice little touch that helps distinguish your product from the competition I feel. Perfect for take out at an Italian establishment. Put two flags into a cut sandwich and voila it looks very fantastic. Better than using a plain toothpick. 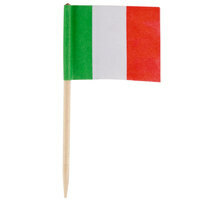 These Italian flag food picks are great for any Italian food service establishment. They are very festive and a great deal, too! What a steal! These are nice food picks that are hard to find!! We used them for an Italian festival we hosted! Great for keeping sandwiches together! Sure to be a conversation starter! Great Italian tooth pick flags. These come in a box which you can show off your Italian made sandwiches with these. helps hold sandwiches together nicely. Magnifico! My Italian family love these little flags. I stick them in appetizers and Italian subs. The flags are true in color to the real Italian flag and look great.